Dodo Juice Buff Daddy Dual Action Polisher: Removing swirls by hand can be hard work, time-consuming and often leads to inconsistent results. The answer is a machine polisher and the most user-friendly of all are the orbital machines (often called Dual Action (DA) polishers). Because the polishing head travels in an orbit, there is less chance of the paint being inadvertently damaged. 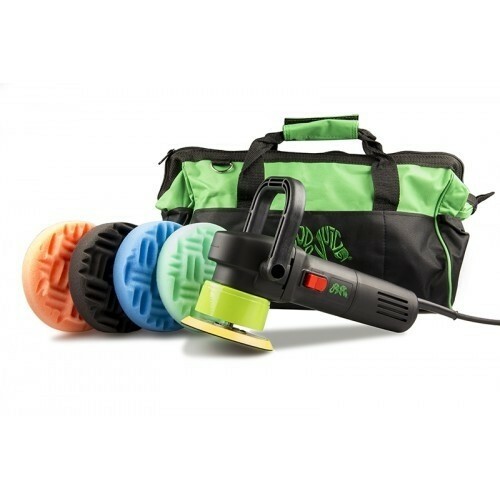 This lightweight (2.3kg) Dodo Juice DAS-6 500W orbital machine comes with a soft touch gear cover, ventilated 125mm backing plate (to fit the usual 5/16 thread), over 3m of cable (UK plug, 220-240v), a choice of D or side handles, spare motor brushes and a Dodo Juice embroidered carry bag. It also has a year warranty and is CE marked. Got this DA on Friday and just had to have a go with on the weekend. After looking at a few DA's this one was by far the best priced, and it by no means lacked quality. The set of pads that come with the kit allow you to get stuck in straight away and the variable control works a treat for removing swirls right through to applying a glaze. The DA is fairly lightweight but can become a little heavy if used for long periods, however I just used the time it took for the products to haze to have a little break. Using the DA I managed to polish, glaze and wax the whole car (Audi A5) in just over an hour, without the DA it would have taken that long just to wax it and been a lot more work. I would suggest purchasing some additional black pads as these will be the ones you will use most once you have got rid of any swirls or scratches. Overall a great product, and the bag comes in really handy.